Pichon Lalande’s 2007 is a seductive, dark ruby/plum-tinged wine displaying sweet cocoa, white chocolate, black currant, and foresty notes, medium body, a velvety texture, and a delicious style. The final blend is 58% Cabernet Sauvignon, 36% Merlot, and the rest Petit Verdot and Cabernet Franc. Drink it over the next decade. 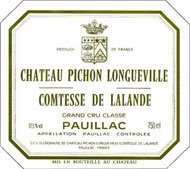 Tasted at BI Wine & Spirits' 10-Years-On tasting, the 2007 Pichon-Longueville Comtesse de Lalande is a little underwhelming on the nose considering its peers, showing some signs of under-ripeness that jars against the black, cedar-tinged fruit. The palate is medium-bodied with fine tannin, tobacco-stained red berry fruit to the fore and with decent weight on the rather leafy finish. It actually finishes better than it begins, although it is difficult to envisage any improvement down the line. Tasted February 2017. Another surprise in this part of the tasting, the 2007 Pichon Lalande is an excellent choice for drinking now, as the aromatics have started to open up nicely. Hints of sweet tobacco, sage and herb all lift from the glass. There is more than enough depth to support another 15-20 years of fine drinking. The 2007 is not a big wine, but instead makes a compelling case for itself with striking aromatic intensity, silky tannins and that most elusive quality of all: balance. This is very nicely done, especially within the context of a year marked by a cool and wet summer.